Moana Hideaway is located on Maui island, ranked #1 Best Luxury Destination in the USA and #2 Best Beaches in the USA by U.S News & World Report published April 19, 2018! Maui island was also voted #2 Best Island in the U.S. by Cond&eacute; Nast Traveler's Readers' Choice Awards published on October 17, 2017. And for the seventh year in a row in 2018, Maui earned the coveted top spot as the #1 Hawaiian Island from Travel and Leisure's esteemed readers! As a Private Paradise Villas guest, you also have an opportunity to play golf at Maui's premiere private club, The King Kamehameha Golf Club. The special per player fee is $209 + tax (Rates subject to change at any time). Limited tee times available, ask your Personal Concierge for reservations! You are also invited to visit their Frank Lloyd Wright designed clubhouse that is adorned with exquisite Hawaiian art where lunch is served in the Wai Kahe Restaurant. You may also want to experience the comforts of the private club with their talented massage therapists. - Guests May Not Bring Personal Amplified Sound/Music Devices to the Property. They Cannot be Used Inside or Outside of the Property. No Exceptions Allowed. toilet, shower, Private bath. Shower has a rain shower head. Paradise. Sunsets were remarkable. The pictures understate the beauty of the backyard . Property had all the amenities. Hot tub and pool were a big hit with our family. The close proximity to shopping, groceries and restaurants was a big plus. The home is outfitted with top of the line appliances, gaming systems and sound systems. Privacy was reasonable as you front the beach which is public and there were people crossing the back end of the property by the beach regularly. One day we sat on the grass watching whales breach. Another day we welcomed a large sea turtle to our section of the beach where she tanned for several hours. The road to Hana is worthwhile but plan on a full day to fully enjoy it. A big mahlao nui loa to our wonderful guests for taking the time to write such a wonderful & accurate review of the fabulous Moana Hideaway. It is perfectly situated ocean/beach front with large sprawling grass from house to water. Complete with panoramic views of stunning nightly sunsets. This villa is stocked with every desired amenity indoors as well as out; large lanai area with pool, spa and bbq pavilion. It is truly a tropical paradise that makes it very hard to leave. Private Paradise Villas offersa fabulous on island concierge team for all of your vacation needs, i.e. activities, car rentals, private chef services, grocery stocking, etc etc. Adrienne is a wonderful hands on attentive caretaker. We look forward to the soon return of our wonderful guests, as well as their referrals of friends and family. From all of us at Private Paradise Villas, a hui hou- until we meet again! This home is everything you could want in a vacation rental! Heated pool, jetted spa, beautiful outdoor kitchen, tiki torches that go on with the touch of a button, and the beach. The main house is up to date and spacious, with great air conditioning for the hot summer months. It is obvious that the owner must love high tech gadgets; there is an amazing sound system inside and out, as well as loads of Xbox and PS3/4 games with game consoles in every room. The bar is well stocked with margarita mix, tequila, bitters, and other essentials. The kitchen has all the gadgets you could imagine and top of the line, at that! For example, there is a Jura automatic coffee/espresso maker (furnished with different kinds of Maui coffee). One of the items we often have trouble finding in a rental is a good rice cooker, but this place had two Zojirushi Japanese rice cookers--one in the main house and one in the cottage. Impressive! Bathrooms were fully stocked with large bottles of shampoo, conditioner, and shower gel, as well as plenty of bar soaps and even sunscreen lip care! There are ample bath and beach towels for everyone. and we never ran out of necessaries, like toilet paper or paper towels. As for laundry, there were two sets of machines, one in the garage and one outside of the cottage, more than enough for our group. Unlike many rentals we have stayed at, the owner let us use his garage for our vehicle, which made it feel even more like home. The cottage unit was described to us as "vintage," and is nice, but less luxurious than the rest of the house. It stands at the front of the property, across from the garage. There are beautiful French doors, a well-stocked small kitchen, and a rather cozy bathroom. The walls are painted cinder block and there are two AC units, a window and a portable. Outside there is a barbecue grill and a patio set, where the cottage cat, Goldie, spends most of her day. Yvonne the concierge was great to work with--"talking story" with her was an absolute delight! She recommended us to a fabulous baker, Casey. His coconut creme cake was to die for! And Adrienne the caretaker was wonderful to work with. She was a tremendous help, promptly finding a service technician for the only hiccup we had during our stay. As for the community--grocery store, restaurants, and Catholic church are close by. And Tamura's liquor store--they have the most delicious ahi poke! All in all, it's such a great place to stay, that it's hard to leave! A big mahlao nui loa to our wonderful guests for taking the time to write such a accurate review of the fabulous Moana Hideaway. It is perfectly situated ocean/beach front with large sprawling grass from house to water. Complete with panoramic views of stunning nightly sunsets. Villa is stocked with every desired amenity indoors as well as out; large lanai area with pool, spa and bbq pavilion. We offer a fabulous concierge team, under Yvonne's hands on care, and Adrienne is a wonderful attentive caretaker. It is truly a tropical paradise and truly hard to leave as stated. We look forward to the soon return of our wonderful guests, as well as their referrals of friends and family. From all of us at Private Paradise Villas, a hui you- until we meet again! The property is beautifully maintained and very well appointed. The view is spectacular. Would definitely return. A big mahlao nui loa to our wonderful guests for taking the time to write such a accurate review of the fabulous Orient Pacific J505 at the Wailea Beach Villas. It is a perfectly situated ocean/beach front resort complete with panoramic views of the ocean/neighboring islands and stunning nightly sunsets. This luxury villa is stocked with every desired upscale amenity one could want, and then some. It is basically turn key, just add your personal items and some groceries, and you have complete luxury at your fingertips. We offer a concierge team to assist with all your island needs, i.e. : activities, car rentals, private chef services, grocery stocking, etc etc. We look forward to the soon return of our wonderful guests, as well as their referrals of friends and family. From all of us at Private Paradise villas, a hui you- until we meet again! Amazing home! Wonderful location and amenities! We had an amazing experience! The home is great with lots of amenities. The house manager Adrienne was on spot with every request! Highly recommend and would love to go again! A Big Mahalo nui loa to our wonderful guests for taking the time to write such a great review of the fabulous Moana Hideaway Beach Villa. It truly is an amazing beach front property, with all the amenities wanted, pool, jacuzzi etc, stunning nightly sunsets, close to town, yet private enough with plenty of room! We look forward to welcoming back our wonderful guests, as well as their extended family and friends to Maui no ka oi. Until them from all of us at Private Paradise Villas, a hui hou! Absolutely Paradise!! We will be back. The property is amazing!! And everything you could ever need is provided. They are also very helpful and easy to get ahold of if you need anything. Ivonne was so great. We truly enjoyed this home and the management team made it a 5 star stay. We will be back and won’t even bother renting through any other company. Just incredible. Mahalo for the memories and a amazing vacation. A huge Mahalo nui loa to our wonderful guests for taking the time to write such an accurate review of the fabulous Moana Hideaway! It is just as they say; all you could want and not enough space to say it all! Upscale fully stocked residence with a beach-entry ocean view heated swimming pool, a hot tub spa that cascades into the swimming pool, a cocktail and grilling cabana with an ice maker, fridge, deluxe grill with side burner, and wet bar sink. Verdant tropical landscaping surrounds the home. Outside by the pool is an enclosed shower and a half bath. We look forward to welcoming you (your friends & family) back to Moana Hideaway and Maui no ka oi as our special guests! Until then a hui hou from all of us at Private Paradise Villas! Fabulous home with a pool and right on the beach ! The home was very spacious , beautifully decorated and provided all necessary supplies. We enjoyed the pool and spa. It also had a big outdoor bar and barbecue facility. The home had grass in the back which was great for playing games and letting the kids run. The back of the house is right on a sandy beach. In the front of the house there is a separate private cottage. We did have a few problems that were immediately taken care of by the property management. We would highly recommend renting this beautiful property. Mahalo nui loa to our wonderful guests for taking the time to leave a wonderful review of Moana Hideaway Beach house. It has & is all that our guests have stated, truly a Hawaiian Paradise. A must for the family who wants room to run & play games, private pool, ocean & beachfront. We so enjoyed having you as our guests, and we look forward to your return to Maui no kai oi. Mahalo for sharing to this home with your family & friends. From all of us at Private Paradise Villas, a hui hou, until we meet again! Set back on the beach and ocean side of a quiet residential street, the property is privacy-gated with a security system. The surrounding ambiance is serene, tranquil and truly relaxing. Moana Hideaway is decorated with flowering and fragrant tropical plants and plumeria (frangipani) trees. Tropical song birds also make it their home. The shoreline in front of Moana Hideaway Beach Estate has a nice quiet small sandy beach area sheltered by an ancient off-shore reef. The ocean gently laps along the shoreline providing a terrific lagoon like area for young children to play and swim in the warm shallow water. Half a dozen wide golden sand postcard-perfect beaches are a short distance away from Moana Hideaway. They are easily reached by car with a 1-2 minute drive, a healthy 2 mile stroll, or a short bike ride. 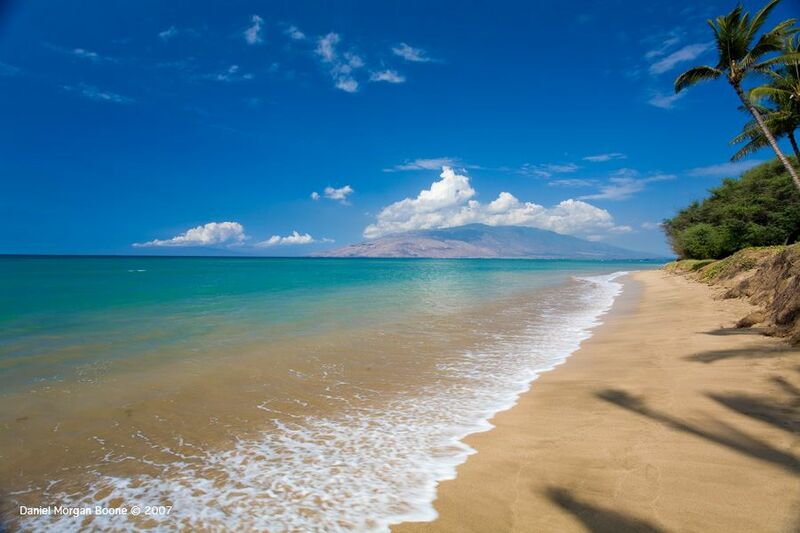 A dozen other sprawling sandy beaches dot the Kihei to Makena coastline. Try a different beach every day! All nearby public beaches provide parking, restrooms and showers.